Mark your calendars for December 15th (if you are in Chicago). Be V.I.P. 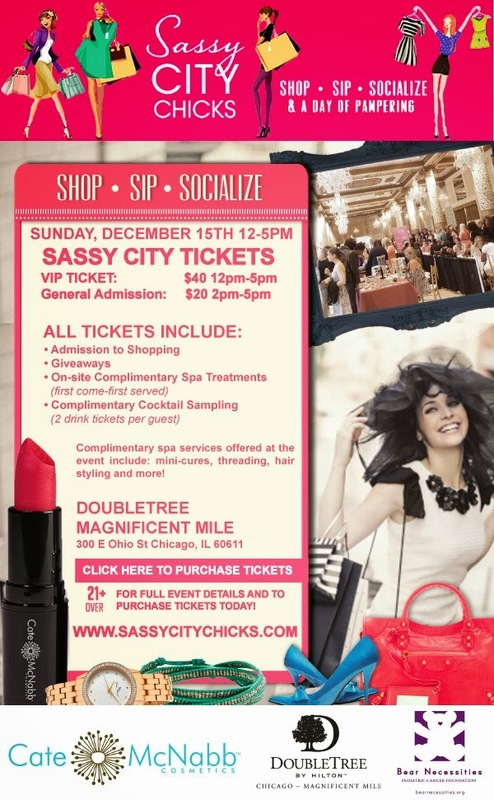 with me and indulge in the perfect girls day out with Sassy City Chicks. Lots of deals. Plus, complimentary hair styling, threading, and more in their exclusive spa lounge. And they’ll be giving away a Kate Spade leather bag at the event! How cool does that sound? I love any time you can shop and sip at the same time. If you’re 21 and over, be sure to pick up a ticket here. Oh and did I mention that I have 30 VIP tickets to giveaway. That’s right! Enjoy this sassy experience from 12-5 pm for free when you use my promotional code, Peacocks!